Can this traditional Indonesian musical ensemble continue to mark the rhythms of human life? 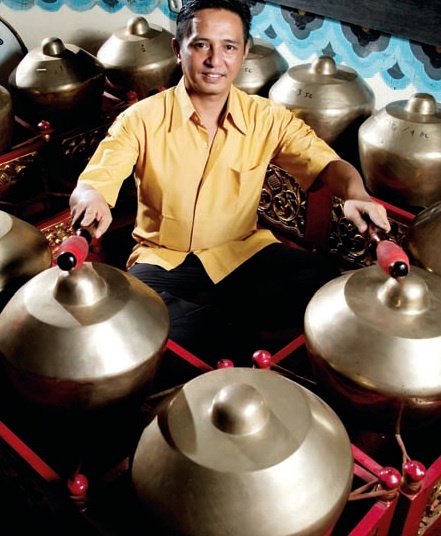 Despite fears that the popularity of gamelan is fading in Indonesia, Kenthus notices that this Javanese ensemble has attracted more and more foreigners, such as those from the US, Australia and Japan. But will this be enough to keep it going? Only time will tell. Literally meaning orchestra, the Javanese word gamelan refers to a traditional ensemble featuring musical instruments such as knobbed gongs, metallophones, xylophones and kendang (drums); it is played in groups from as small as four to large ensembles of up to 25 musicians, together with solo and choral singing. 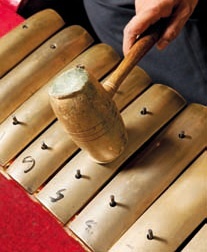 “In gamelan, the kendang is the conductor, as the drummer keeps and changes tempo. The harmony of the gamelan music epitomises the natural rhythm of life, making the music so suitable for traditional theatrical plays such as wayang kulit [shadow puppetry] and wayang orang [dance drama]” says Teguh “Kenthus” Ampiranto, gamelan and wayang orang instructor. Both wayang kulit and wayang orang narrate classical epics, mostly from the ancient Hindu texts, such as Mahabarata, Rama and Sinta. “Each of the melody types in the gamelan music, called pathet, represents a philosophy of human life. The high notes in pathet 6 tell about the joy of a newborn. The middle notes in pathet 9 recount the tale of how people earn their living. The low notes in pathet 12 depict life in old age. More often than not, it’s where people are facing death,” he adds.